What comes after Labor Day? Christmas. Just kidding. Or if you’re a camera manufacturer—maybe not so much. With the first inklings of the holiday season settling in, camera companies are right out there with brand new fixed-lens and point-and-shoot models that they hope have just the right mix of features to make buyers consider toting more than just a smartphone in their pockets. 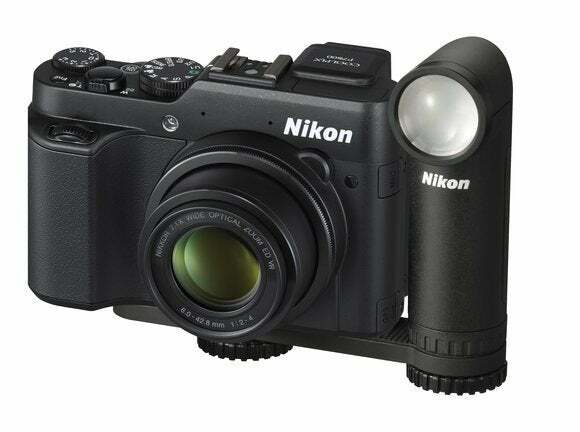 Nikon has unveiled an update to its Coolpix P7700, its advanced fixed-lens long-zoom digicam, and the specs are quite similar. The new P7800 has a large 1/1.7-inch, 12.2-megapixel backside-illuminated CMOS sensor, fast maximum f/2.0-f/4.0 aperture, vibration reduction (stabilized) lens, with a 7.1x zoom (28-200mm equivalent). Unlike the P7700—with its famed video-oriented articulated flip-out LCD screen, the new model also includes an electronic viewfinder to help advanced and pro-level users visualize and capture both still and HD video in low light. The 921,000-dot LCD on this model has an anti-reflection coating and six levels of brightness adjustment for better viewing in sunlight. Despite a brighter display, battery life remains the same as the previous model, at about 350 shots per charge. No worries, proud P7700 owners; that model isn’t going anywhere—the new model sits alongside the older camera. The P7800 shoots 8 frames per second in full HD and offers a complement of scene and shooting modes. Plus, like the P7700, it’s compatible with the optional WU-1a Wireless Mobile Adapter, from which users can use Wi-Fi to shoot and share to compatible smartphones or tablets via the free Wireless Mobile Utility app. The Nikon Coolpix P7800 will be available later in September for $550. Almost at the opposite end of the size, and certainly the skill spectrum, is a new Nikon point and shoot that literally sits in the palm of your hand. With this line of cameras, Nikon is targeting a stylish crowd who wants something small and unobtrusive, but yielding high-quality shots for sharing on the social networks. The new Nikon Coolpix S02 is the newest member of Nikon's ultra-compact S line, measuring 3.1 x 2.1 x .7 inches and weighing 3.6 ounces. The S02 joins the S01 to offer an expanded choice of simple quick snappers, but with some notable improvements. The S02, like the S01, is easy to operate but has a slightly larger 2.7-inch touch screen. It features a 13.2-megapixel CMOS sensor, a significant upgrade from the S01, which had a 10-megapixel CCD. A 3x zoom Nikkor lens shoots both stills and Full HD (1080p as opposed to 720p) video. The Coolpix S02 also includes consumer-oriented features like Scene Auto Selector Mode, which automatically chooses the right scene mode based on the subject or location—such as portrait, landscape, night portrait, night landscape, close-up, and backlighting. The Coolpix S02 also now includes a night scene mode for better low-light shots and backlit scene HDR for improved image quality in bright light. Special effects including Mirror, Sepia, High Contrast Monochrome, High Key, and Low Key can help run-of-the-mill shots look special. The Nikon Coolpix S02 will be available in silver, white, pink, and blue at the end of September or early October for $180, the same price as the previous model at launch. To top off the camera updates, Nikon has introduced the LD-1000 LED Movie Light, a new optional accessory for the Nikon 1 and Coolpix lines. It features a built-in diffusion panel to facilitate even exposures. The bracket can be removed, allowing the light to be held by hand for better control over the lighting angle. This device emits light continuously, rather than immediately like a camera flash, so its effect can be monitored via the live view in real time. The Nikon LD-1000 LED Movie Light will be available in October in black and white for $100.